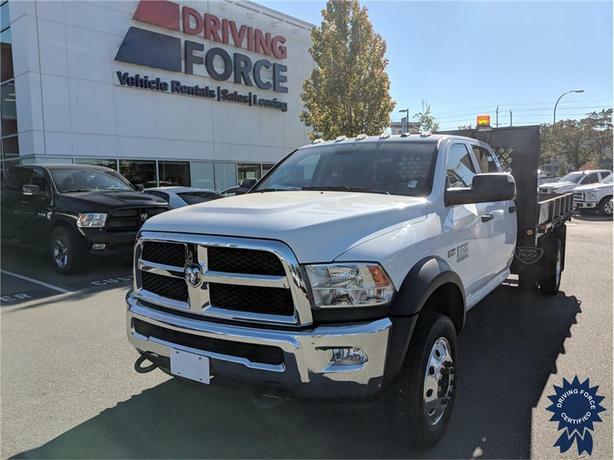 This 2016 Ram 5500 SLT Crew Cab 6 Passenger 4X4 DRW 12-Foot Flat Deck Truck comes with a 197-inch wheelbase, 197-inch wheelbase, 84-inch cab-to-axle, 6-speed Aisin heavy-duty automatic transmission, 4.44 rear axle ratio, 19.5-inch wheels, cloth front 40/20/40 bench seat, power take-off prep, electronic shift-on-the-fly transfer case, 220-amp alternator, trailer brake control, transfer case skid plate shield, heavy-duty front suspension, full-size spare tire, fog lamps, black vinyl floor covering, Uconnect 5.0-inch Touch/Hands-Free system, upfitter electronic module, ParkView rear backup camera, voltage monitoring idle-up system, towing with harness and trailer sway control, HD shock absorbers, front anti-roll bar and rear HD anti-roll bar, hydraulic power-assist steering, auto locking hubs, two 12V DC power outlets, Bluetooth for phone, auxiliary audio input, and GVWR rating of 18,000 lbs (8,164 kgs). The 6.4-litre Hemi V8 gas engine provides 367 horsepower at 5,800 RPM and 429 lb-ft of torque at 4,000 RPM. Touch base with us to discuss purchasing or financing options that are right for you and experience the difference you will only find at DRIVING FORCE Vehicle Rentals, Sales and Leasing.